Breaking new ground for MRI imaging in diagnosing cancerous lesions and observing the body in real time as it metabolizes various molecules, Hadassah’s Center for Hyperpolarized MRI Molecular Imaging is an innovator in its domain. 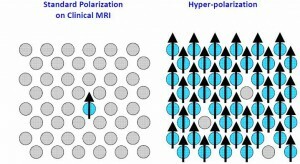 Using a technique called hyperpolarization, the Center is able to increase the sensitivity of an MRI scan 10,000 fold. Specifically, two of the Center’s ultimate goals are to diagnose a lesion accurately enough to decide whether it requires treatment and which type, without the need for a biopsy; and to be able to understand how medications given for neuropsychiatric/degenerative conditions such as Parkinson’s disease, Alzheimer’s disease, schizophrenia, Attention Deficit Hyperactivity Disorder (ADHD), and severe depression function within the body and prove therapeutic. Under the directorship of Dr. Rachel Katz-Brull, the Center is developing its own unique molecules (called molecular imaging probes) that will help unravel this mystery. A major advantage to these probes is that they are nonradioactive, making the MRI an option for children, pregnant women, and those patients who need repeated metabolic imaging scans. 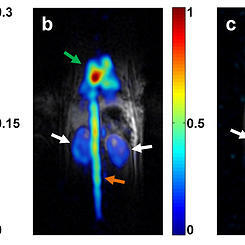 These probes allow the researchers to visualize a specific activity, a function at the molecular level, within the body. Conventional MRI is not sensitive enough to “see” these molecules. The particular focus of Hadassah’s imaging center is developing probes for cancer and neuropsychiatric disorders. The Center is now in the process of producing and conducting pre-clinical testing on various biomarkers for brain, prostate, and breast cancer, along with markers for schizophrenia, ADHD, Parkinson’s, Alzheimer’s, and major depressive disorders. The goal is to witness abnormal uptake of the molecules or abnormal metabolic pathways which will indicate the presence of cancer or a neuropsychiatric disorder. 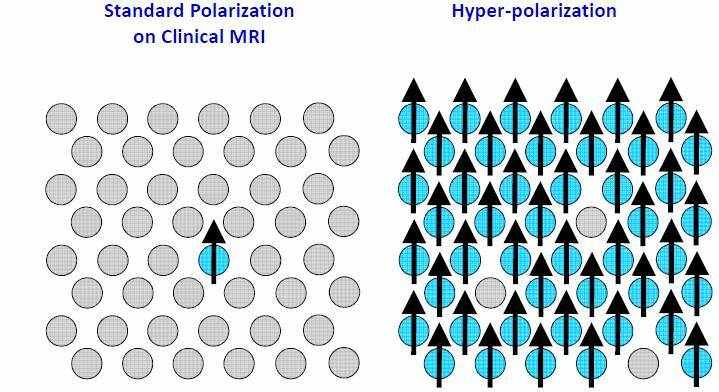 This abnormality is revealed by the way the hyperpolarized molecules are distributed on the MRI. The Center’s Research is carried out in collaboration with Hadassah colleagues Prof. Jacob Sosna, Chair of the Department of Radiology; Prof. J. Moshe Gomori, head of MRI and Neuroradiology; and Prof. Tamir Ben-Hur, head of Neurology, along with the Hadassah-Hebrew University Faculty of Medicine, as well as with a worldwide network of physician/scientists at other research institutions who are leaders in this new field of Hyperpolarized MRI Molecular Imaging. Dr. Rachel Katz-Brull notes: Once the pre-clinical trials are completed, the goal is to ”bring this technology from bench-side to the patient’s bedside”—to begin clinical trials with human patients.